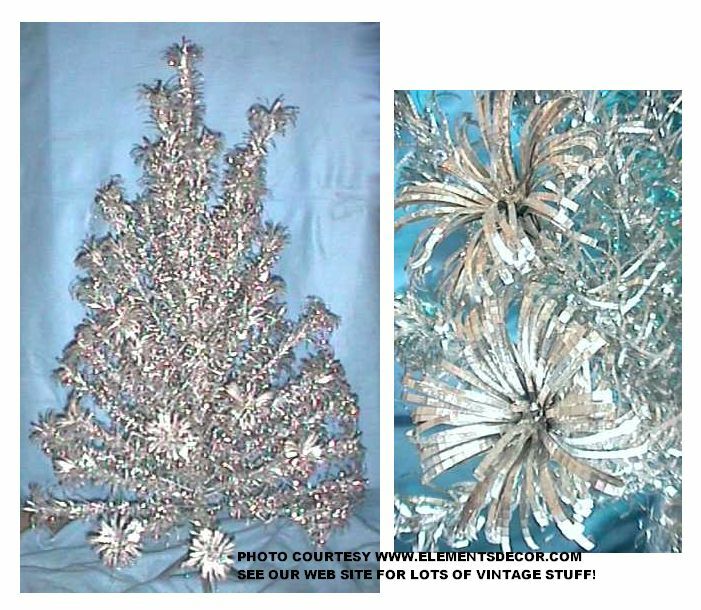 Aluminum Christmas Trees – Photo archive of aluminum trees / tinsel / silver trees we've either sold, or are no longer available. 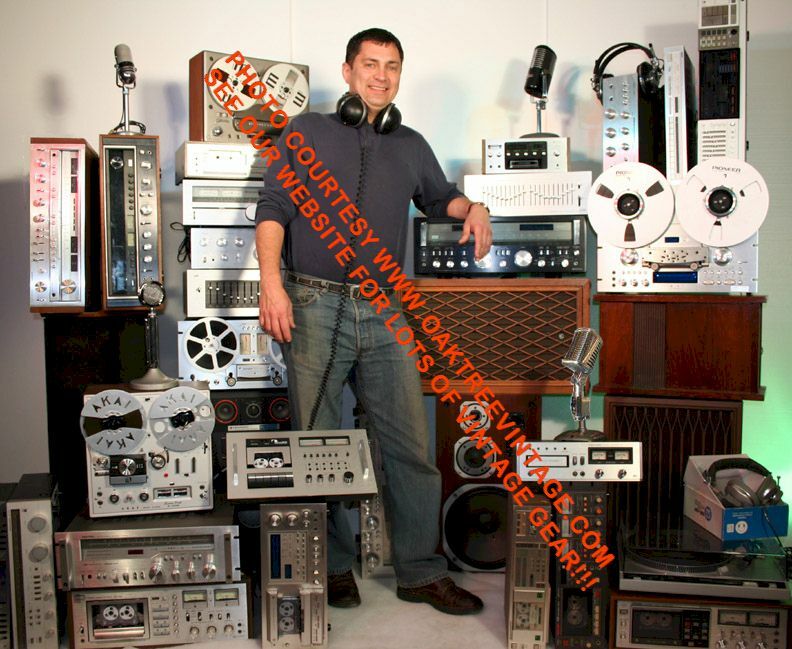 Some will have been of recent manufacture, many will be original / vintage / classic from the 1950's & 1960's / fifties / sixties. 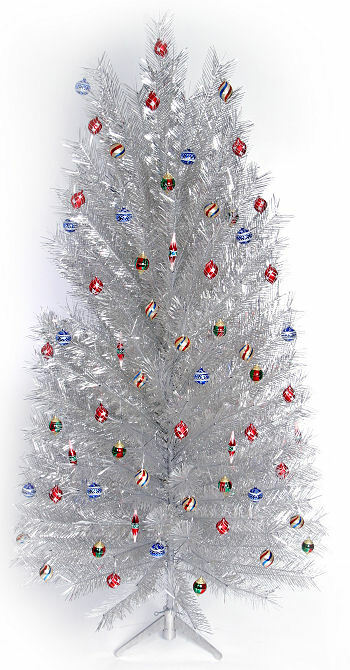 Some may aluminum artificial Christmas trees with 'pom poms' and 'fountain' branches. 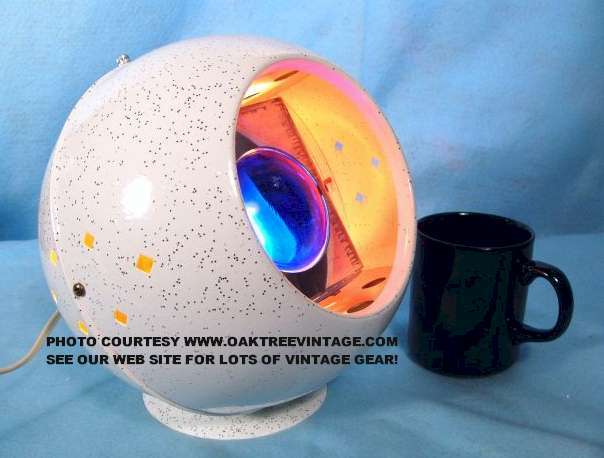 Classic space age / era mid-century Christmas decoration. 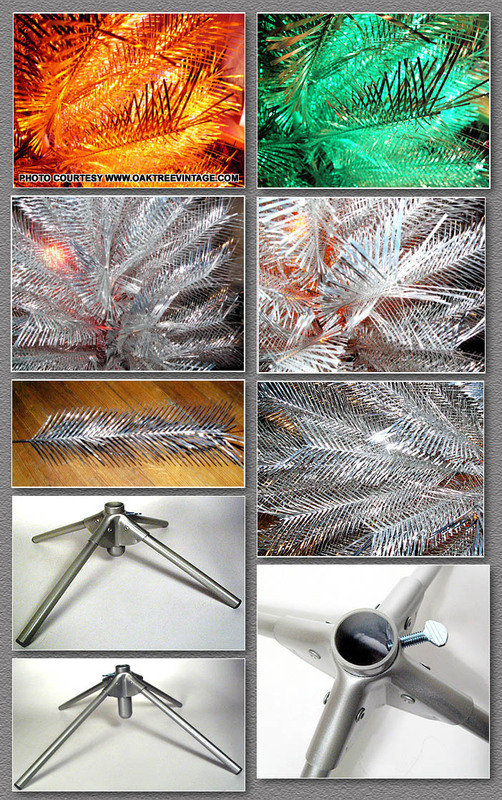 CLICK HERE FOR OUR PAGE OF ALUMINUM CHRISTMAS TREES CURRENTLY FOR SALE . . . 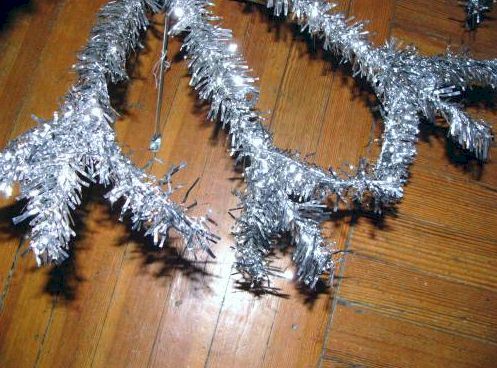 If you have an Aluminum Christmas, this is the first and a MUST HAVE accessory you need. Since you should not string electric lights on Aluminum Christmas trees, a Rotating Color Wheel is the traditional and best way to light it. For maximum viewing pleasure order one of our color wheels. The color wheel lenses are Green, Blue, Red and Orange. It is designed for up to a 60 watt Halogen Spot / Flood* light (not included). There is an On / Off switch on the AC cord. While one is great, 2 gets both sides, and 3 is crazy colorful. Yeah, Baby! $54.99 when ordered with a tree! * Color Wheels have always been designed since their inception in the 50's, to work with Spot or Flood type bulbs. Standard light bulbs are "omni-directional" and will be very ineffective as a light source when used in a color wheel. base extensions. The new LED bulbs work great and fit well, generating far less heat and using many times less electricity. Also, they are essentially built in the same manor they have been built in since the late 1950's. Some of the originals were metal, and some plastic. They all had plastic color wheels, that will melt / distort if exposed to excessive heat. This is usually caused by a wheel that has it's rotation impeded by something against it or because it get's knocked over. The motors while small looking do last many, many years. Again, they are using the same design and technology they were using in the 1950's, and I have lots of originals that are still working, so while the new one's are not made in the US, the new one's should last similarly. 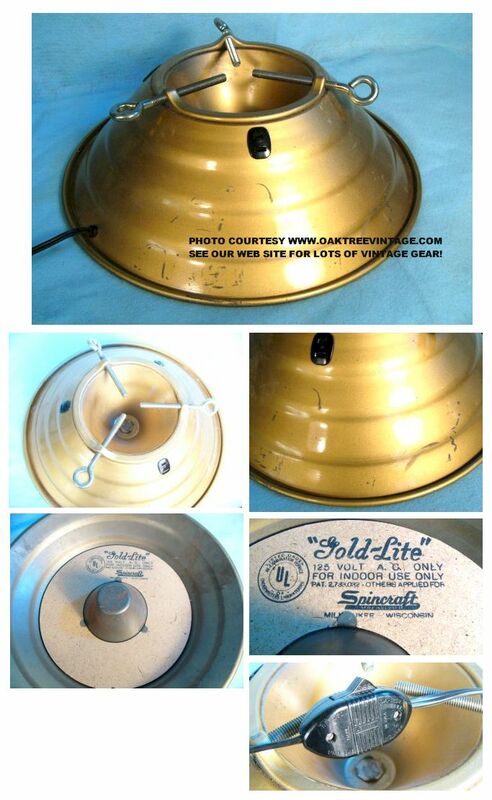 Original retro, "Gold-Lite", Christmas tree stand. Great original shape. Has 3 AC outlets to plug in your tree lights. Will work with real tree or Aluminum tree. Metallic Gold finish in good shape with normal scuffs and wear. No significant rust or dents. All outlets work well. AC cord has built-in switch. This a stationary stand and does not spin or play music. Measures 17" in diameter and ~5.5" tall. 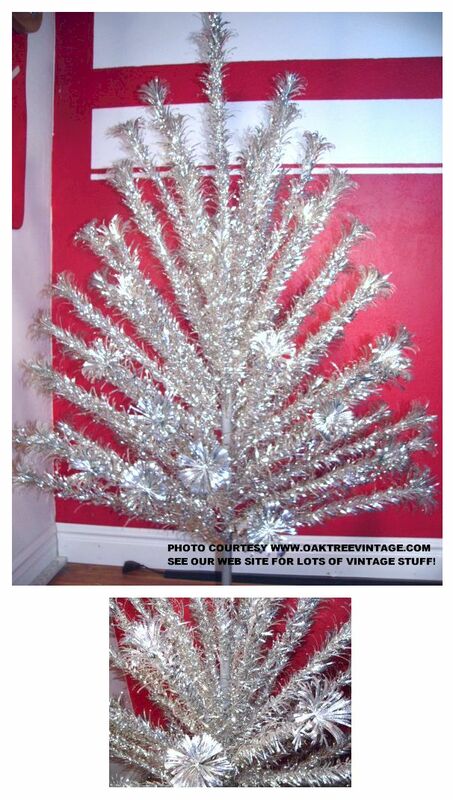 Beautiful original, vintage 6' aluminum 'Sparkler' "Pom-Pom" Christmas Tree with 94 branches. This is an original late 1950's tree with "Pom-Pom" / Fountain style branches. Includes 94 branches and aluminum tripod stand. Looks great. A very nice medium-large display tree. Very shiny! 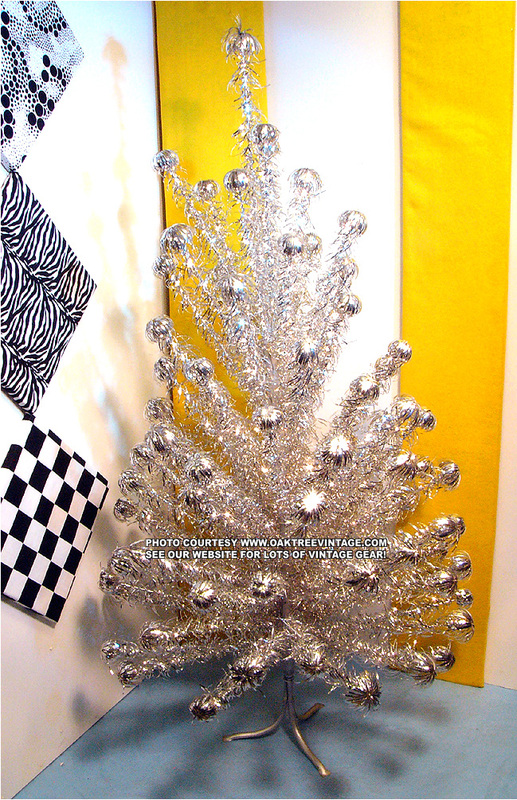 Of the original vintage style Aluminum trees, "Pom-Pom's" are the most desired. We have had 20-30, "original" vintage trees over the past 4 years and this is the best example we have had in both original quality and current condition. It comes with it's original box which is in incredible condition. The box still has all it's original paper storage sleeves, which are in near NEW condition and even has the original paperwork. The labeling on the box is still perfectly legible. Even the original store price tag is still intact. The branches, stand and trunk are all in excellent condition as well. The needles are all holding great! The trunk has no breaks or repairs and the original stand is perfect as well. Even though the box and paper work list the tree as having 91 branches, this one has 94 and all with matching sleeves. The tree measures 40" across its widest point at the bottom. This tree in pristine condition and needed no repairs (unlike almost all the rest of the "original" trees we have had). A hard to find treasure! 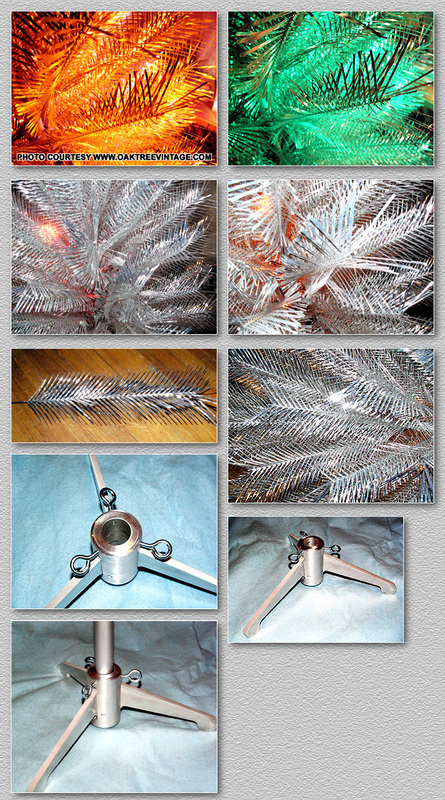 Beautiful original, vintage 6' aluminum 'Sparkler' "Pom-Pom" Christmas Tree with 89 branches (originally came with 91. There are no unfilled holes that we can find, so are thinking the two missing were spares). This is an original late 1950's early 1960's tree with "Pom-Pom" / Fountain style branches. Includes 89 branches and aluminum tripod stand. Looks great. A very nice medium-large display tree. Very shiny! 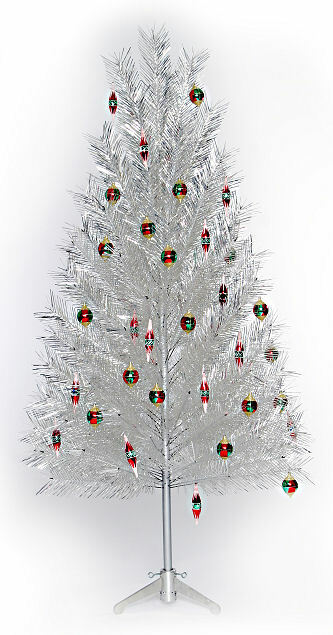 Of the original vintage style Aluminum trees, "Pom-Pom's" are the most desired. We have had 20-30, "original" vintage trees over the past 6 years and this is the best example we have had in both original quality and current condition. It comes with it's original box which is in incredible condition. The box still has all it's original paper storage sleeves, which are in near NEW condition. The labeling on the box is still legible. The branches, stand and trunk are all in excellent condition as well. The needles are all holding great! The trunk has no breaks or repairs and although the original stand is a bit "unorthodox" in it's design and assembly, it is perfect as well. The tree measures 40" across its widest point at the bottom. This tree in great condition and the only issue is a slightly worn hole where the trunk locating pin fits. It's slightly wobbly, but that could be addressed with some tape around the metal pin. We'll leave that to the new owner if they wish. It stands just fine as-is. A hard to find treasure! 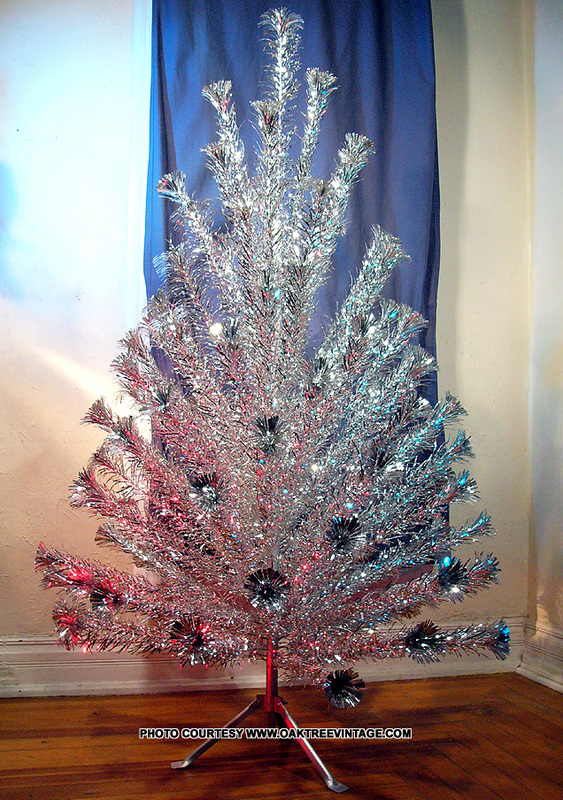 Decent condition aluminum Christmas Tree. Includes 59 branches and aluminum tripod stand. Has a nice "spike" branch at top for crowning with star or whatever you want to put there. Lowest row of branches terminate in 3 "finger" branches. Stands 5' tall and is ~30" in diameter at the lower branches. Looks great and is easy to set up. A very nice small display tree when you wish to see more of background through the branches. Tree disassembles into two sections and branches stay attached. No need to assembly all the separate branches. Just fold them down and splay them out the way you wish. Very shiny! Includes folding stand. 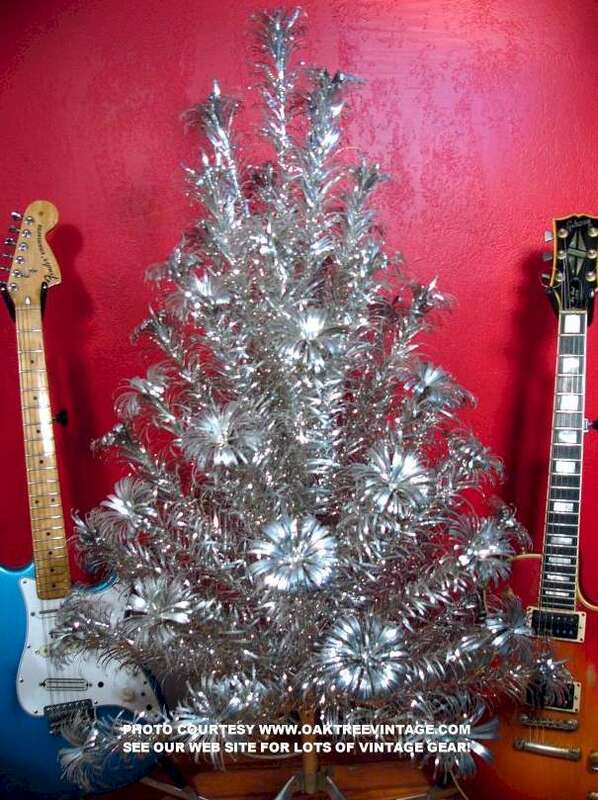 Like NEW condition and swell looking aluminum Christmas Tree. This is an old original one with "Pom-Pom / Fountain" style branches. Includes all 58 original branches with all the original paper sleeves, 2-piece trunk and aluminum tripod stand. Looks great. Stands 49" tall and is ~32" in diameter at the lower branches. Looks great! Nice "medium-full" look. A very nice small-medium room / store display tree. Very shiny and perfect! Branches in perfect shape with no "un-raveling" and all holes in the trunk filled with a branch when assembled. With original Box. While not included, the guitars in photo should give an idea of scale. 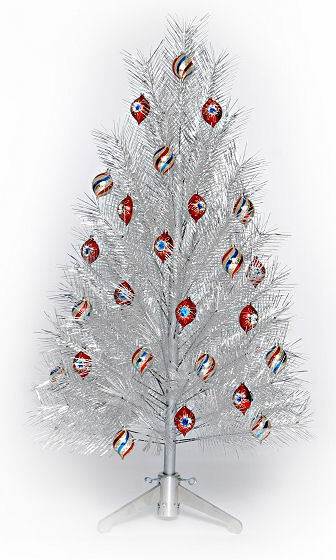 Really cool & original retro, "Wonder Rainbo Lite", revolving / rotating Aluminum Christmas tree light. We have had a few original rotating lights in the past, but this is the most unique and it has the original box, packing, instructions and un-filled out warranty card! White with Gold Flake finish. 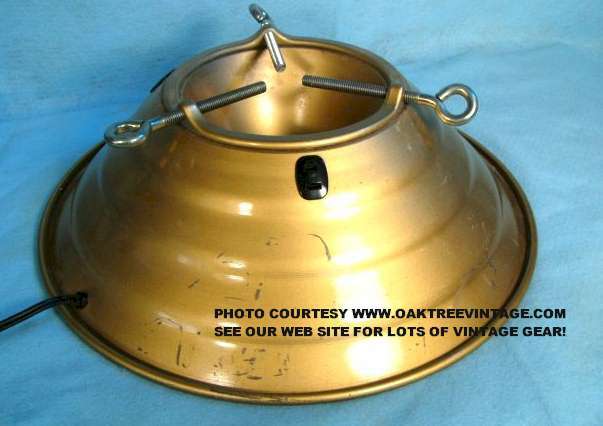 Measures 8" in diameter and ~9" tall when on base. Can point in any direction while resting on it's original base. 4 colors, Red, Orange'ish Yellow Green and Blue. The light comes through 3" color lenses so it is very focused and much more intense than most rotating lamps. Also the lenses are made of glass, not plastic so they won't melt or fade over time. Colors are very intense! Switch will also allow it to simply stop on one color if you wish. Works and runs well. This thing is in like NEW condition! 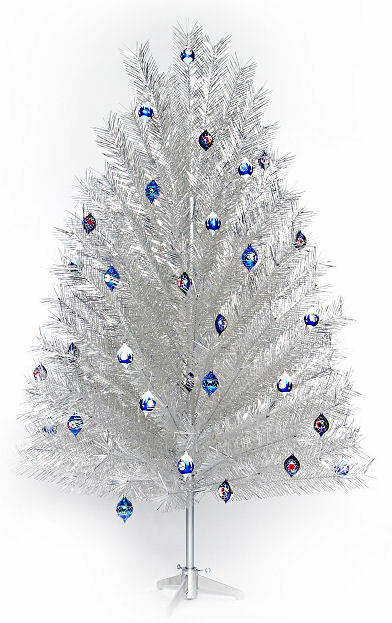 Beautiful looking aluminum Christmas Tree. This is an old original one with "Pom-Pom / Fountain" style branches. Includes 150 branches (some are extras, tree fits ~ 145). Looks great. Stands 7' tall and is wide at ~56" in diameter at the lower branches. Looks great! Nice "Very-full" look with 150 branches. Branches still in good shape (a few of the extra branches have wear, but are not needed as they were spares). A very nice medium-large display tree. Very shiny! With original box, and branch tube covers. Use with any standard Christmas tree stand (not included). 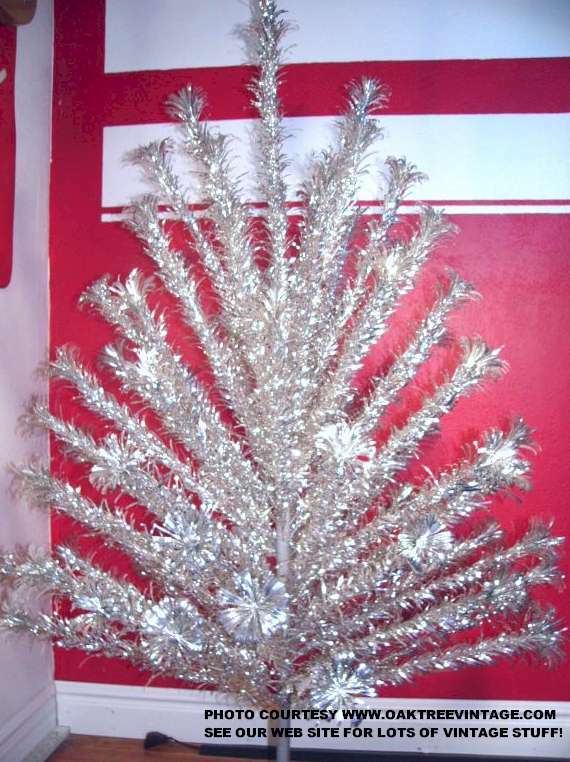 Very nice condition and swell looking aluminum Christmas Tree. This is an old original one with "Pom-Pom / Fountain" style branches. Includes 58 branches and aluminum tripod stand. Looks great. Stands 49" tall and is ~32" in diameter at the lower branches. Looks great! Nice "medium-full" look. A very nice small-medium display tree. Very shiny! 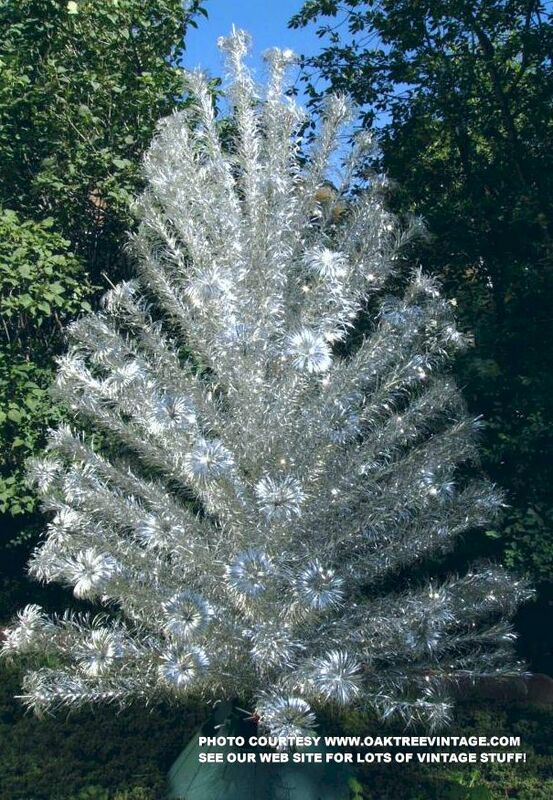 Beautiful looking aluminum Christmas Tree. This is an old original one with "Pom-Pom / Fountain" style branches. Includes 72 branches (originally had 73, but missing branch not noticeable) and aluminum tripod stand. Looks great. Stands 6' tall and is ~42" in diameter at the lower branches. Looks great! Nice medium-full look. Branches start 11-15" up from the floor depending on adjustment of trunk in stand. A very nice medium-large display tree. Very shiny! With original box, stand and most branch tube covers. Includes original folding stand. (originally had 73, but missing branch not noticeable) and aluminum tripod stand. Looks great. Stands 6' tall and is ~42" in diameter at the lower branches. Looks great! Nice medium-full look. Branches start 11-15" up from the floor depending on adjustment of trunk in stand. A very nice medium-large display tree. Very shiny! With original box, stand and most branch tube covers. Includes original folding stand. The 9 ft "Classic" Aluminum Christmas Tree is a TALL tree. It stands 9'2" tall and has a diameter of approximately 54". With 154, 27" branches, this tree is full and really needs little or no decorations to add a festive holiday appearance to any living room. However, the sturdy base and stiff branches hold even the heaviest ornaments. This 9' model is our biggest tree ever. Weighs in at 40+ lbs when packed up (Ships at 70lb rate). The tree comes packed in a heavy duty box with cardboard tubes to protect each branch. 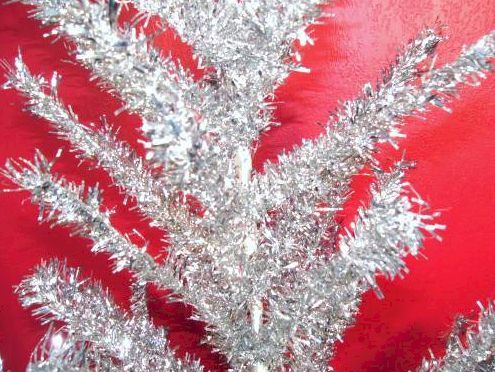 The new 9 ft * "Slimline" Aluminum Christmas Tree is a TALL tree. It stands nearly 9' tall, at 103 inches in height and has a diameter of approximately 44". With 154, 20" branches, this tree fills an area from floor to ceiling using a smaller footprint than the 9 ft * Classic Christmas tree. It really needs little or no decorations to add a festive holiday appearance to any living room. However, the sturdy base and stiff branches hold even the heaviest ornaments. This 9 ft * model is our second biggest tree ever. Weighs in at 34+ lbs when packed up (Ships at 70lb rate). NOW SOLD OUT, PERMANENTLY AS OF 11/6/12. 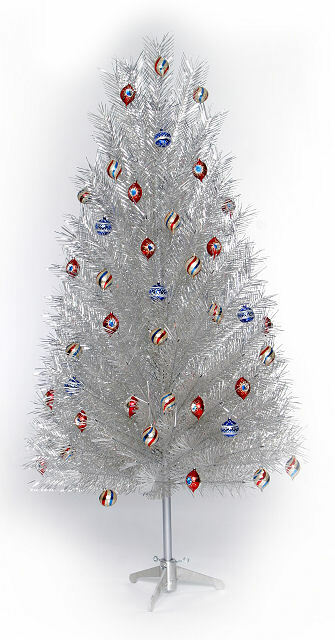 The 7 ft "DeLuxe-Classic" Aluminum Christmas Tree is one of our best sellers. The "Deluxe" series offers 33 additional branches for a total of 133! It stands 7'6" tall and has a diameter of approximately 54". With 133, 27" branches, this tree is very full and really needs little or no decorations to add a festive holiday appearance to any living room. However, the sturdy base and stiff branches hold even the heaviest ornaments. The tree comes packed in a heavy duty box with cardboard tubes to protect each branch. We also include the tubular steel stand with each 7' tree. These stands are amazingly well built from tube steel, and unfold to a wide, 21" footprint. For maximum viewing pleasure order at least one of our color wheels. The 7 ft "DeLuxe-Slim-line" Aluminum Christmas Tree is great for those who want a full height tree, but are limited in space. The "Deluxe" series offers 33 additional branches for a total of 133! The tree is 7' tall and has a diameter of approximately 44". With 133, 20" branches, this tree is full and needs little or no decorating to add a festive holiday appearance to any living room. However, the sturdy base and stiff branches hold even the heaviest ornaments. 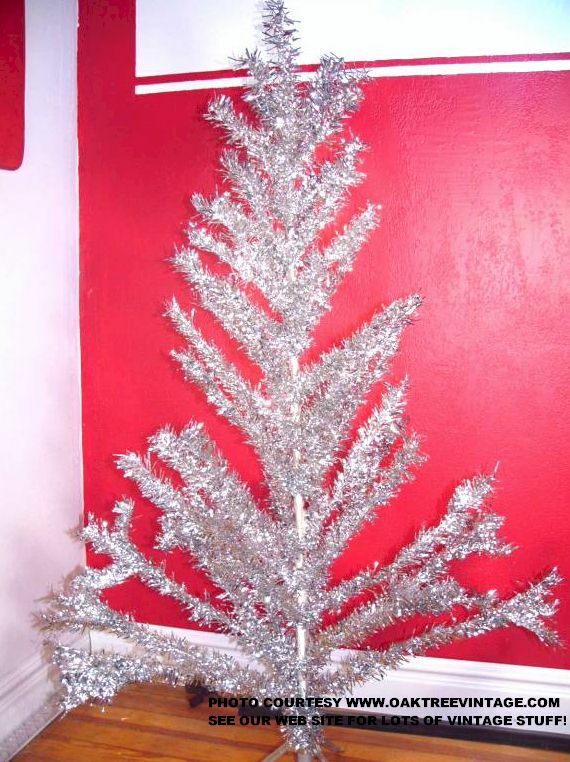 The 7 ft "Slim-line" Aluminum Christmas Tree is great for those who want a full height tree, but are limited in space. The tree is 7' tall and has a diameter of approximately 44". With 100, 20" branches, this tree is full and needs little or no decorating to add a festive holiday appearance to any living room. However, the sturdy base and stiff branches hold even the heaviest ornaments. 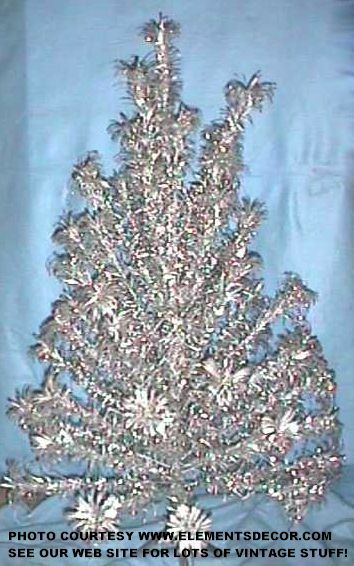 The 5 ft* "Slim-line" Aluminum Christmas Tree is designed for rooms with limited space It is 54"* tall and has a diameter of approximately 32". With 70, 14 inch branches, this tree is full and really needs little or no decorations to add a festive holiday appearance to any normal living room. However, the sturdy base and stiff branches hold even the heaviest ornaments. The tree comes packed in a heavy duty box with cardboard tubes to protect each branch. We also include a solid milled, aluminum stand with each tree. These stands are amazingly well built from billet aluminum. For maximum pleasure and convenience order at least one of our color wheels. * Tree actually measures 54 inches in height. AGAIN, ALL NOW SOLD OUT. SORRY.